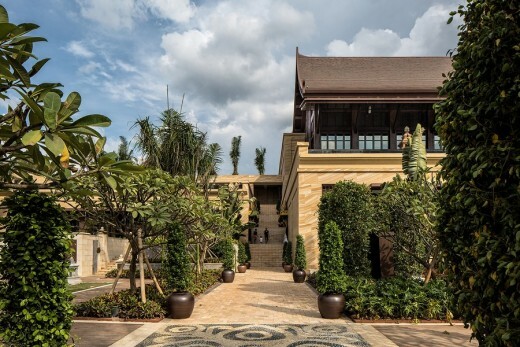 This luxury hotel resort was designed to become a hidden sanctuary in one of China’s most emblematic regions. Sitting on the slope of a mountain the resort is constructed in such way that it naturally integrates itself into the local culture via architecture, planning, and detailing. The blending of tradition with the expectations of the cotemporary Chinese traveler sets its view into a new era of china’s tourism. 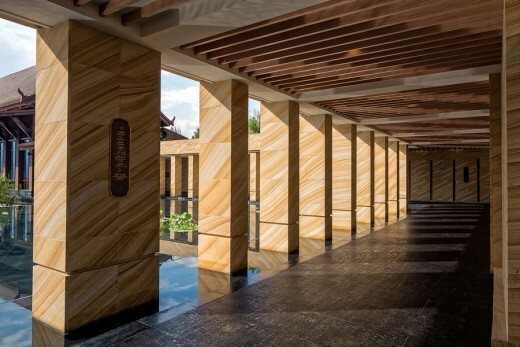 As one of the fastest-growing tourist destinations in the Chinese province of Yunnan, this resort makes a great leap forward with the development of the Chinese luxury style resort. 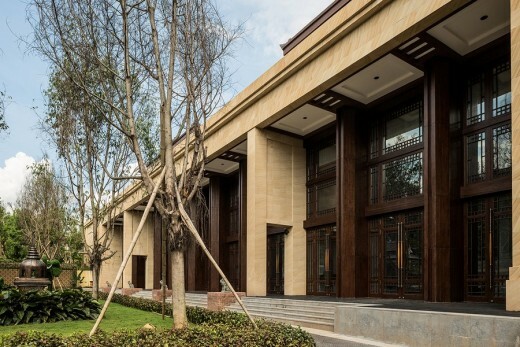 It is in this wonderful enclave that OAD, Office for Architecture + Design, designed for the Dalian Wanda Group this luxurious resort hotel that is to be considered one the groups’ crown jewels. 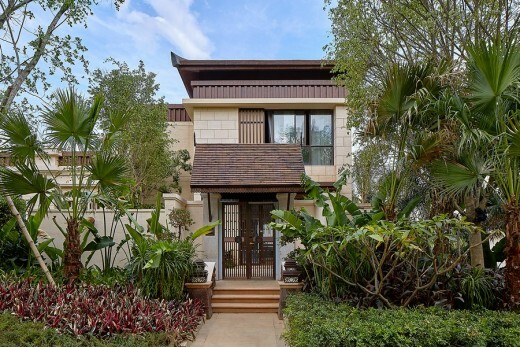 The resort, which had its opening on September of 2015, constitutes a remarkable endeavor that combines the technical and functional expertise that OAD has in this sector with a vernacular approach that is based on the deep study of local architecture. 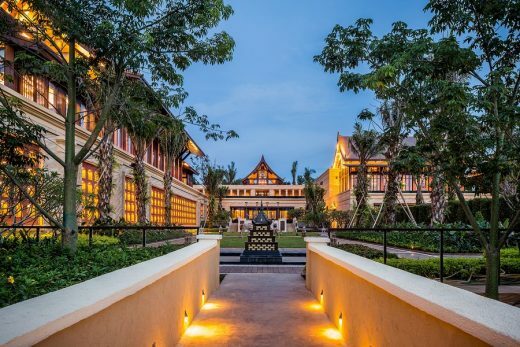 A five star plus destination that contains 151 villas, Conference Center, Spa Center, Pagodas, pertaining amenities, and a sumptuous natural setting. 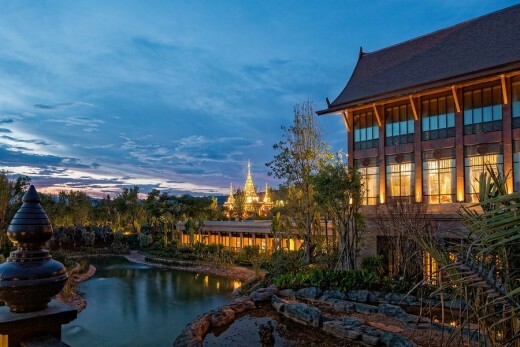 Wanda Vista Xishuangbanna is located in the most southern city in Yunnan province, one of the most emblematic regions of China, characterized for is natural wealth and cultural diversity. 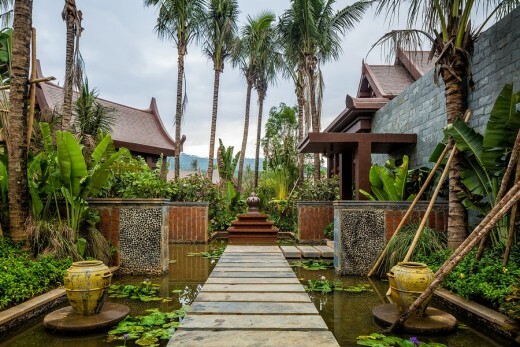 Hidden in the imposing mountains of the Ga-dong district northeast of Jinghong city and influenced by the unique architecture style of the local Dai ethnic minority that provides a sensibility that is both luxurious and romantic. 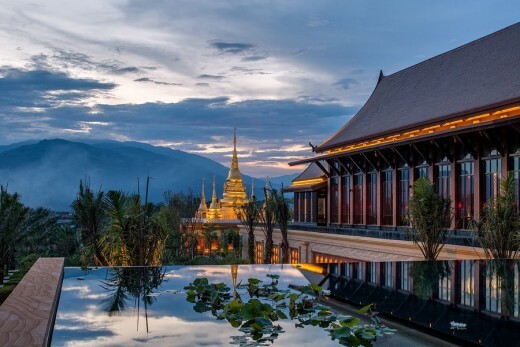 “Xishuangbanna” means an ideal land of magic in the ancient language of Dai. 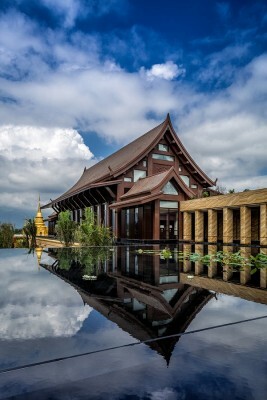 Only after carefully studying and fully understanding its special elements and origins of local culture and architecture, did the architects take the traditional Dai architecture and planning as the inspiration to build a contemporary construction building and bridge it with its origins and surroundings. 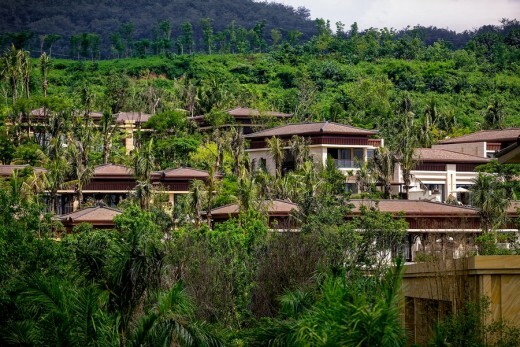 This relationship is particularly evident in the profile of the buildings, where its silhouette emerges from a luscious tropical landscape and traces its outline with a series of cascading layers that generate a clear dialog with the indigenous villages and mountains. 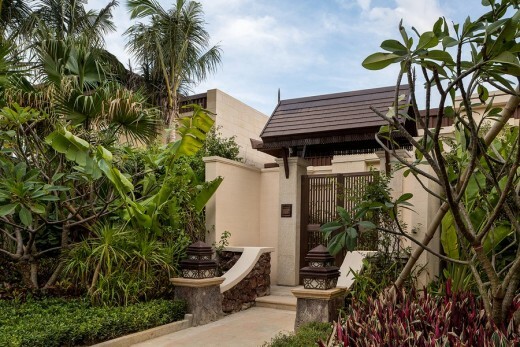 This composition is further underlined at the entrance and public areas where beautiful gazing views and spectacular sunsets are presented to the guests. The structures and roofs of the public area take inspiration from traditional architecture. 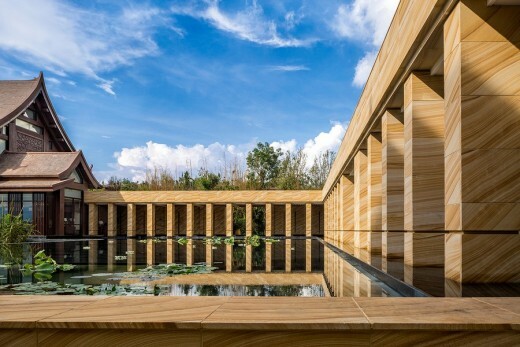 Walls are made of wood and stone that when illuminated generate the feeling that is found throughout the local villages and religious buildings. The golden sensation that materials and lighting provide along with carefully designed landscapes generate a sense of belonging. 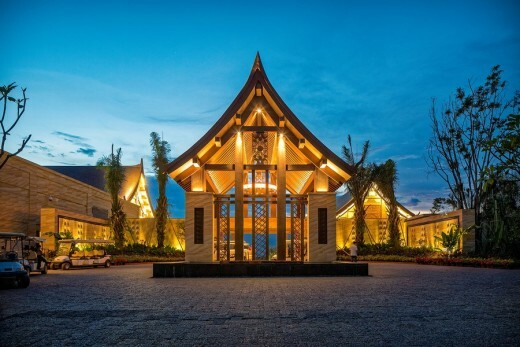 Carefully proportioned, the lobby and restaurant create a large open yard and the multiple wood levels on ceiling and floors generate a comfortable asymmetry that engage the mountainside and mountain views effortlessly. 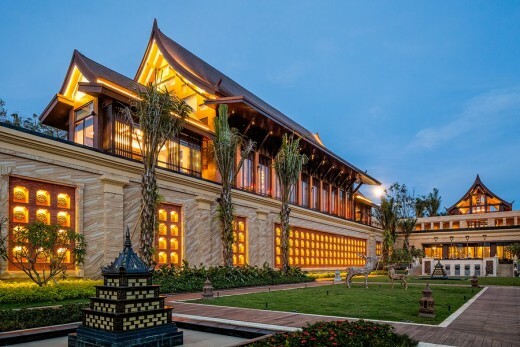 In order to deal with the ballroom’s large volume, the largest of the entire hotel, the designers decided on multiple planes rather that a single whole façade. Different levels and materials diminish the façade’s large scale. This along with a rooftop garden and structures of smaller scale make the building much more approachable and utilitarian. The small pavilions on the rooftop act as smaller meeting and conference rooms that not only enjoy beautiful views, they also enjoy the scale of the more local architecture providing open but also private working areas. 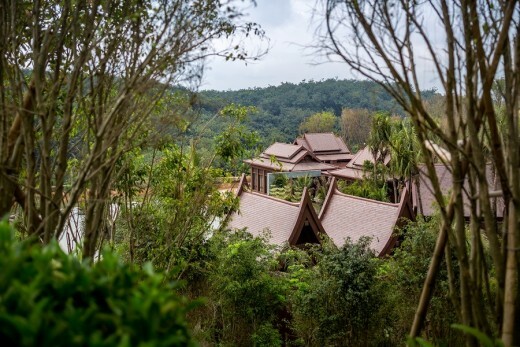 The creation of this “hidden temple” mountain resort was the result of combining an emperor style architecture, which is considered hierarchically more luxurious and spatially grander than local vernacular architecture, and the architecture style found in Dai style villages and temples. 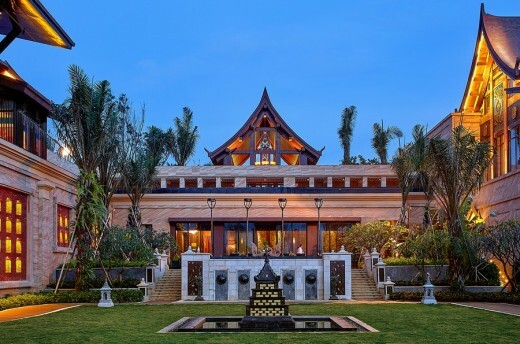 The high style detailing of imperial architecture blended with local traits generate the feeling found thru out local villages and religious sanctuaries with the stateliness of imperial design. 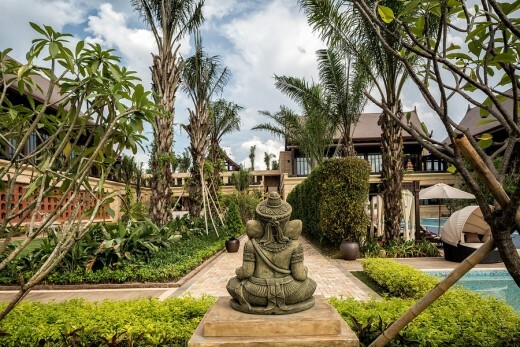 This effort and the inclusion of elements such as pagodas and imagery reminiscent of religious buildings, makes for a serene and inspiring setting. The peacock is one of the patterns found throughout the resort but stands prominently on the entrances feature wall and the pools floor. 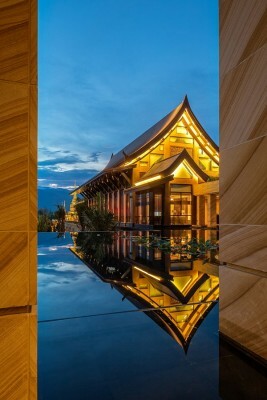 It is the totem and sprit in the Dai culture and along with the tall roofs, stone base, and wooden structures the designers incorporate the unique style of Dai. This is how the design came to be, a reminiscence of old time buildings with modern luxury. 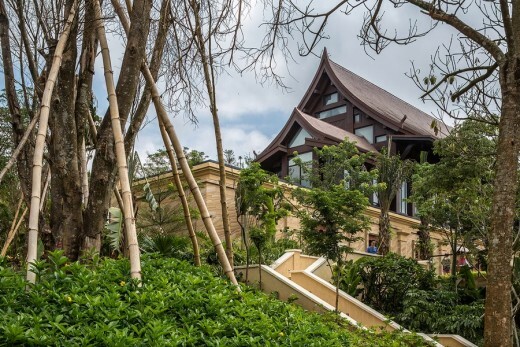 A Chinese sanctuary hidden in a mountain of Xishuangbanna. Interiors: Wanda Institute of Hotel Design and Research Co.,Ltd.